How has your week kicked off? The weather continues to be balmy here in Calgary. Now that the busy summer is over, I have been enjoying trying a new recipe here and there. 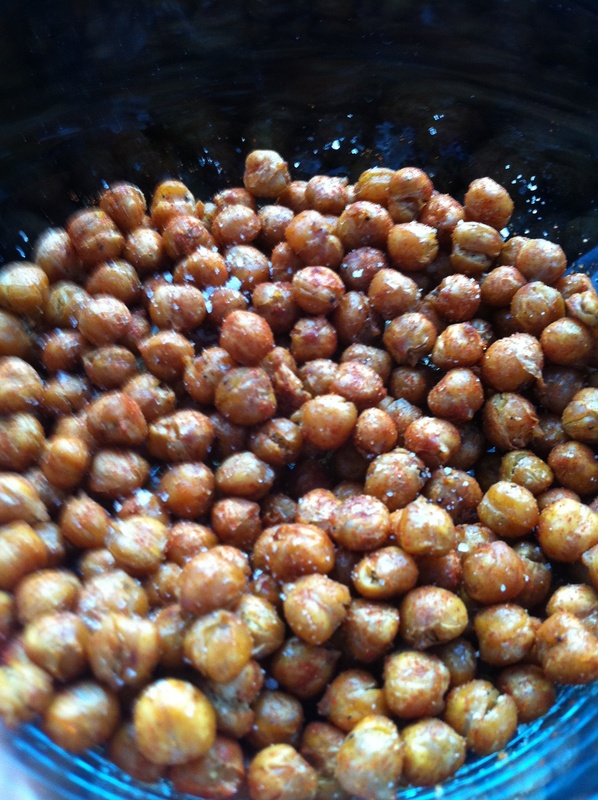 The other weekend I tried one of Mark Bittman’s recipes for Roasted Chickpeas. I was looking for something simple and healthful to bring to a certain someone’s non-birthday party and I knew an experiment would be okay with this crowd. For his actual recipe and blog click here. I adapted his recipe to my tastes and seasoned with hot smoked paprika and sea salt. Smoked paprika is popular in Spanish foods. It is super flavourful. I picked some up after taking a Spanish cooking class with Tony before our honeymoon to Almeria, Spain a few years back. At the cooking class we made toasted blanched almonds with smoked paprika and sea salt, which were amazing. I figured it would make chickpeas exciting too. Pre-heat the oven to 400F. Heat the oil over medium heat in an overproof fry pan/skillet that is large enough for the chickpeas to be in one layer. If you have a pan with a handle that might be sensitive to heat, I have seen chefs wrap tin foil around it. Once the oil is hot, add the chickpeas, garlic, half the salt and some cracked pepper. The garlic and chickpeas will crackle a bit, shake the pan so the chickpeas are coated. Place the pan in the oven. Roast in the oven for 20-30 min (mine took 30 to get a crunchier skin), shaking the pan every 5 min or so. When they’re done, sprinkle with the paprika and the rest of the salt, toss, taste, adjust and serve. I found the crispness didn’t last very long, but everyone that tried them said they were good and would be good on a salad too. Tony kept eating them in the car on the way to the party (bad distracted driver). These look really delicious 😀 Great idea.